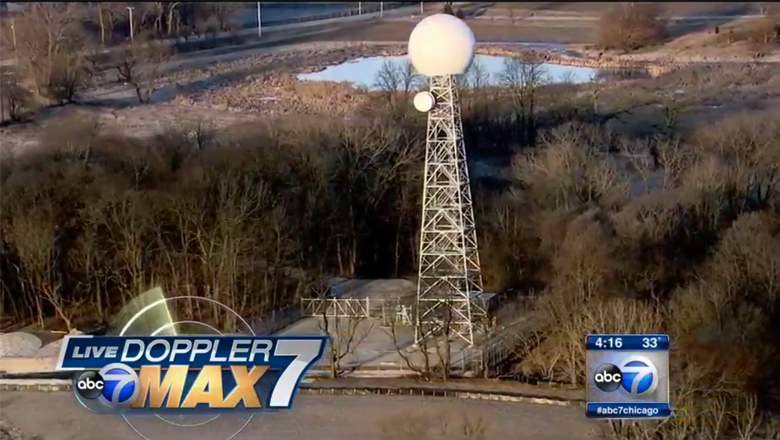 WLS-TV, the ABC O&O in Chicago, has spent weeks hyping up its new “Live Doppler 7 Max” radar — but its big debut was a bit of a dud thanks to Mother Nature. The station powered up the new radar during its 4 p.m. newscast Monday and has been filling its newscasts with packages touting the power of this “one of the kind” radar system. The only problem? There was basically nothing the radar, which is apparently the best thing since sliced bread, could detect. The entire Chicagoland area was covered in a basically boring weather day — but of course that didn’t stop the station’s meteorologists from throwing the scan up as much as possible. Another point that was constantly driven home was letting viewers know they could tell the station is in “Doppler 7 Max Mode” when the radar sweep turns yellow (though the shade of yellow selected is a bit weak and not all that easy to distinguish from the normal white). Of course, we are just heading into the severe weather season for the Chicago area, so hopefully the radar will be put to better use. WLS Television Inc., the parent company of WLS-TV, applied for and was granted a zoning exception by Kane County for building the radar tower on a small portion of a 53-acre property in a rural part of the county. The station purchased the land, which is about 60 miles from Chicago, in August 2015, according to county records.